Spotting a gap between physical and mental health services for children has inspired Adele Watkins throughout her career. Ms Watkins, clinical nurse specialist for children and young people in crisis at the Children’s Hospital for Wales in Cardiff, is a dual-qualified children’s and mental health nurse. She has used her knowledge and experience to develop an innovative specialist nurse role to ensure all children who come into the hospital have the high standard of mental health nursing care they require and deserve. 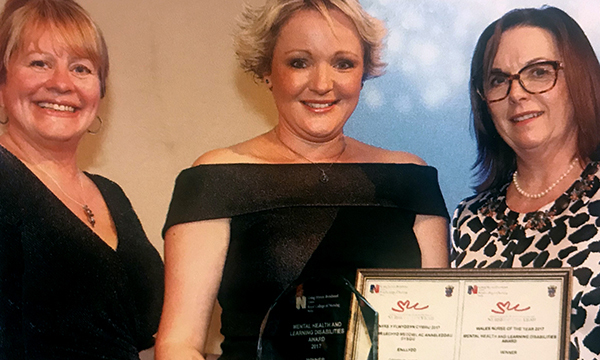 Last November, her work, which ensures the voices of children with mental illness are heard, and that they are treated with dignity and respect, scooped the mental health and learning disabilities category at the RCN Wales Nurse of the Year 2017 awards. Ms Watkins qualified as a children’s nurse in 2001 and went to work in a ward for young people, where she quickly became interested in caring for the mental health of her patients as well as their physical needs. ‘I nursed a lot of young people who were coming across at the time from mental health inpatient units and required medical intervention,’ she says. She became the link nurse with a local mental health inpatient unit for young people. ‘I could see there needed to be a link between physical and mental health services. That is something I have been driven to improve since right back then,’ she says. In 2005, Ms Watkins took a one-year course to become a registered mental health nurse. While the course was geared towards adult services, she chose placements that would be helpful with young people, including community, drug and alcohol, and acute mental health services. After completing the course she went back to her job on the general ward. She used her skills caring for those with mental health problems, including eating disorders and suicidal behaviour, and patients with other conditions who also had mental health needs, such as those with body image issues who required spinal or abdominal surgery. In 2006, when the unit closed, Ms Watkins moved to a surgical ward. She frequently provided support to young people diagnosed with brain tumours and their families when surgery was required, and worked with patients with mental health needs elsewhere in the hospital. Ms Watkins had been seeking opportunities to provide more specialist mental health nursing in the hospital and, when given the opportunity to explore the need, she found demand was growing. There were 150 admissions to the hospital of children and young people in crisis in the whole of 2016 but 50 in just the first ten weeks of 2017. In January this year, she became the hospital’s clinical nurse specialist for children and young people in crisis. Her job includes direct patient contact with those admitted, and liaising with child and adolescent mental health services (CAMHS) and others. Patients should be assessed by CAMHS within 24 hours of being admitted. ‘I ease that journey, and make phone calls between the services and spend some time with the patient, explain the process and get as much information so that when the assessment is done with CAMHS we are prepared,’ she says. Another key aspect is providing staff training on mental health, supporting colleagues through specialist mental health training, and developing policies and paperwork that improve the patient’s journey. In the future, Ms Watkins hopes to build further on the service and plans to provide a suite for CAMHS assessments to take place. ‘It is a challenging job, but it is a role that I have aimed to achieve for a long time, and the job satisfaction is great,’ she says.